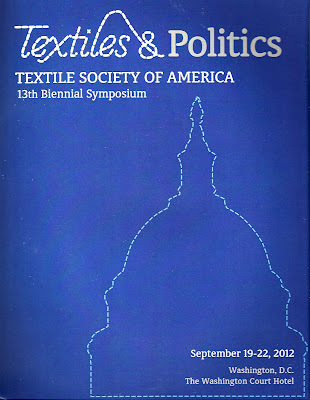 Last week I attended the Textile society of America’s biennial symposium in Washington, D.C. I have enjoyed membership in the society for many years. For anyone not familiar with TSA let me briefly explain. 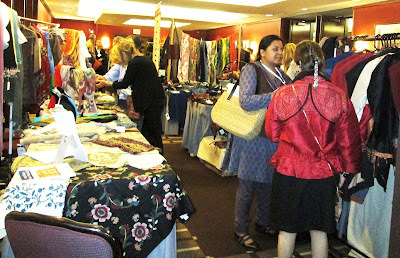 The Textile Society of America is a nonprofit organization, established in 1987, with over 700 members in 36 countries. The membership includes anthropologists and archeologists, museum curators, textile historians and teachers, designers and textile makers, as well as collectors of textile and dealers. 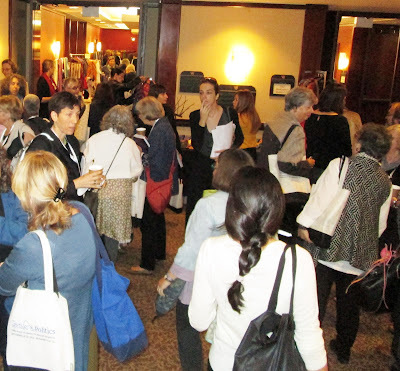 Besides the wonderful biennial conference some other benefits of membership include workshops and study tours, an online newsletter, an extensive bibliography of textile publications co-published with the University of Minnesota and a membership directory. There is also a website which is right now being expanded and will be up this month. The TSA’s mission “ is to provide an international forum for the exchange and dissemination of information about textiles worldwide, from artistic, cultural, economic, historic, political, social and technical perspectives”. 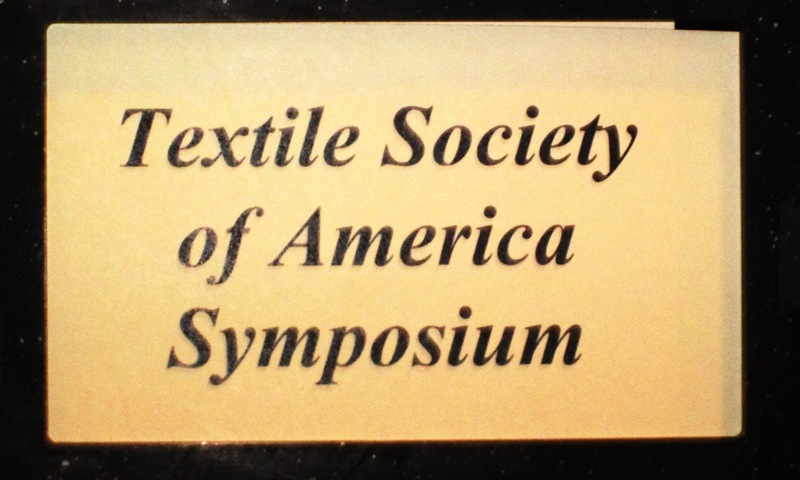 (Elena Phillips, President, TSA) That is quite the statement but, actually, it is because of this wide range of involvement that brings together so many disciplines, giving everyone interested in textiles an opportunity for interaction and learning. The Symposium was the 13th conference of the society and included more than 450 members plus visiting lecturers. There were site tours of various museums and textile collections (I attended a private tour, there were only 12 of us, of the Natural History Museum Support Center, for a behind-the scene look at the extensive collection of the anthropology department. Join me next week for my adventure.) There were 15 different tours offered and I wish I could have attended them all but unfortunately all tours were the same afternoon, so much to learn, so little time. There was a private tour by the Textile Museum of their new exhibition ( again, another blog) and there were 3 sessions per day, 3 days, of 6 concurrent sessions each with 3-5 speakers per session from which one could chose to attend. That adds up to more than 112 mini lectures on every textile topic one could imagine. Again the choice was often difficult as everything in the lecturer’s abstracts sounded intriguing. If this was not overkill enough, there is also included in each symposium additional tours that take place before and after the official conference. Now comes the fun part, and that is shopping. A market place of textile vendors included a fabulous selection of clothing, vintage and ethnic pieces, jewelry and accessories. If any member has not participated in a symposium, I would strongly urge you to consider attending. The location for 2014 is Los Angeles. 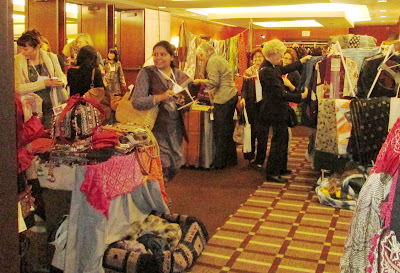 And any textile scholar, designer, or textile lover and collector that is not a member should visit the website for more information. Every modern nation undergoes an industrial revolution as it enters into the competitive world of manufacture and trade. One of the first industries to be transformed is the textile industry. First with water power for mills, then power looms, textile production goes from the home and small workshops to the first factory systems. When other crafts follow, the machine age has begun. Now, when a country moves from an agri-economy to an industrial one, it is greeted as a sign of coming prosperity and modernization. That was not always the case. For example, in England there was great controversy with opponents decrying the machines as the enemy of workers, taking their jobs and producing inferior goods. (Sounds a bit like today) One institution that has long praised the worker, whether the craftsman in his workshop or the factory worker on the assembly line is the Victoria and Albert Museum in London. Their premise, which was and still is illustrated by examples of workmanship, has been that there can be good and poor quality in machine-made goods, just as there are good and poor examples of hand-crafted products. While workers may be replaced by machines, new jobs are formed. New workers are needed to manufacture the machines themselves and well as maintain them. More production means more sorting, packaging, distribution and advertising. Change is not always easy, but inevitable. Where there are advantages, there are also abuses. Dickens' stories of Victorian life, so depressing, were, I think, an understatement. Thousands of people descended upon the cities seeking employment. In no way were these cities in a position to sustain even the poorest quality of life for all. The factory conditions were appalling and the treatment of the workers even worse. Why? EXPECTATIONS! The cost to furnish, even a small workshop-factory with the new machinery was enormous. Investors EXPECTED a return on their monies, a big return, and they EXPECTED the managers and supervisors to produce. In turn, the supervisors could only satisfy if they hired as many workers as possible for the lowest of wages, kept long working hours and ignored concerns of health and safety for the workers. The question is why did the workers stay? They were not slaves, nor serfs. They were free to return to their rural life and raise turnips! EXPECTATIONS! Some felt that if they worked diligently, they may, someday ,be promoted and earn more (right!). Some believed that if they, their wife and children all worked night and day they could collectively save a few pennies and eventually have a better life (Some of us believe we will win Megabucks with a $1 ticket). The majority were just stuck, downbeatened and barely surviving with no hope of anything better. By uniting in trade and workers unions and cooperatives, workers had strength in numbers and demanded reforms. This also was a double edged sword. The manufacturers violently opposed this system, the unions, in turn, proposed strikes and slowdowns with violence toward non-union member workers. While management grudgingly accepted the unions' role the power of the unions and their leaders was immense. Graft, political influences, and criminal associations were not unheard of. Reforms, for both union and non-union workers, came with legislation. Labor laws reduced the hours workers were forced to perform and minimum wages demanded a more uniform pay scale. There was legislation against child labor and and compensation for workers injured on the job. Agencies were set up to inspect factories and ensure safe working conditions. But today, there are still mining disasters, oil-rig explosions and worker injuries due to faulty and poorly maintained equipment. There remains the problems of human trafficking and child labor issues. Think coffee, chocolate and high-priced sneakers. To paraphrase an economic principle “ where there is demand, there will be someone to supply”. But at what cost?